After our Wednesday with Lucy N DVD, we all are inspired to knit with beads. So many ways to add touches of charm, glitz & glam.. makes one's head spin... try it and see how it goes... We viewed the section on lace work too... The Leaves & Bead Smoke Ring had just arrived so perfect timing for a picture. Pat K is working on a gorgeous cowl in soft white with pearl beads - a gift for a friend... I wonder who''s next on her list?? 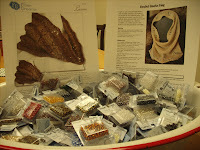 I'm working on a beaded bracelet pattern for a quick knitted gift... pics to follow..
Hand knit socks are gems to have. If you knit socks for someone special - this post is for you. Follow along with Wise Hilda and gather "footsie" measurements. 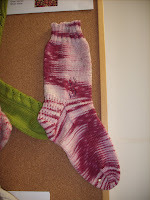 WH is working on better finished sizing for sock patterns. Check her blog for the email address. 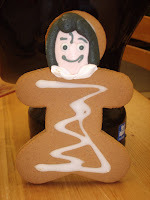 Yesterday at knit class we celebrated with the famous "Elvis King cookies" made by our local Tim Horton's. Jan Trude and group have been making these cookies for years now. 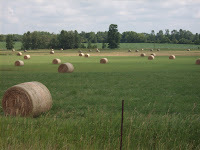 ALL proceeds are donated to the Collingwood General and Marine http://www.cgmh.on.ca/ for their education programs. It was our summer movie afternoon knit class. The temperatures were soaring outside while we were coolin off with Lucy Neatby DVD viewing. Once again the class discovered new techniques and fun ways to add changes to their projects. 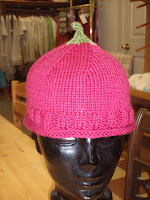 In keeping with our Apple Pie Trail product line, we have just finished our children's Apple hat. 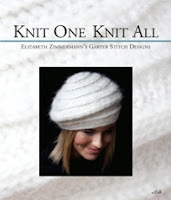 The pattern will only be available in our hat kit with instructions to make up in sport, DK & worsted weight yarn. The rolled edge followed by ribbing sets off a nice edge. The sample is made up in Mission Falls yarn. Look for it on our shelves next week. 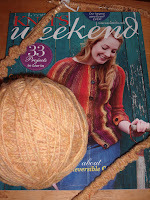 Knit One Knit All... EZ's new book... It's here!!! I can't believe my eyes. Standing at my shop door this morning was a package with the new Knit Scene mag and the new hardcover book "Knit One Knit All". Its delightful photos of recipe cards in Elizabeth's hand writing, fabulous pictures and of course outstanding designs- hats, jackets... which one to make?? I love Lucy... not Ricardo but Neatby!!.. We had such fun yesterday. I planned to host a Lemonade & Popcorn party every Wednesday afternoon with the knit group so we could watch Lucy Neatby DVDs. Yesterday was our first show. How much fun did we have?? TONS!!... so much so they want to watch the same DVD again. The cast ons, & offs followed by the Inc & Dec was so interesting- they want to view it again... The helpful tips and how to/why info combos was such a good fit. Sometimes one has to get into knitting for a while so when a DVD of info come along it opens the mind to new concepts instead of confusing one. They are keeners now to try a few of their new techniques. 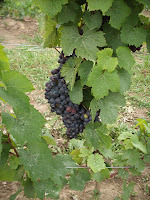 Next week pictures... We were pleased to have join our group Marsha from PA USA. Her husband was on the golf course and she had dropped into the shop the day before, we chatted about the movie afternoon and she joined right in. If you might think Lucy's DVDs would be interesting- try it you'll like it!! We do have a wonderful selection of sock yarns- stop by & check us out. 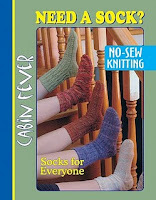 Contact greyheron@bellnet.ca for sock kit inquiries. 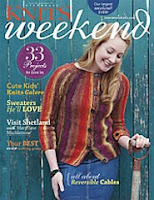 I have choosen Softspun from Briggs & Little to make a beautiful scarf from the latest Knits Weekend mag. I'm starting the Wheat Field Scarflette by Cecily Glowik MacDonald. It's cute and do-able in a short time, even though cast on is 422sts... no time for chatting while that's happening. stay tuned for more pics!! $15.99 only 3 left... hot item..